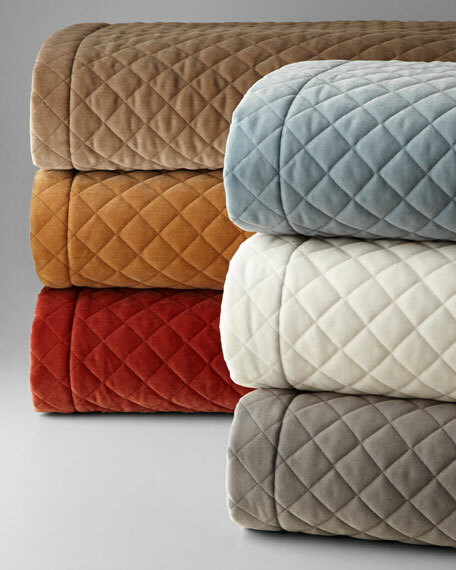 EXCLUSIVELY AT NEIMAN MARCUS Solid velvet coverlet set. Includes two velvet shams with 2" top stitch flange. Two-piece matching back with zip. Polyester; dry clean. Coverlet: 90" x 95". Made in the USA of imported materials. Teardrop-textured coverlet with 1" flange finish. Polyester/olefin front; cotton/polyester back. Has hidden zipper so you can add a filler for additional loft (filler not included). 92" x 96". Dry clean. Made in the USA of imported materials. Quilted coverlet. 300-thread count cotton sateen. 100 GSM polyester filling. Machine wash. 96"Sq. Imported.